My fabulous office manager Amanda has finally given me a reason to spend on supplies, she needs a work bag! We've decided to modify a Nappy Bag pattern to suit her needs, so I'll be showing you a few different tutorials to make your own bag suitable for work! 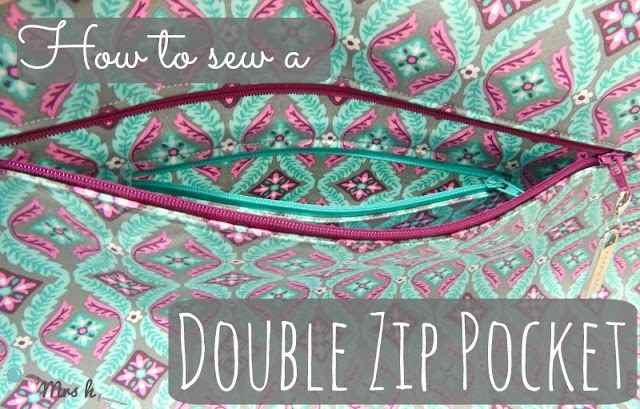 Today we'll be showing you how to make a double zip pocket. This is excellent for a work bag, we all have things we need to keep hidden away at times, whether it's your phone, car keys or personal items. From the outside it looks like a regular zip pocket, but there's another zip pocket inside. This double zip pocket does add bulk to the lining side that it's inserted into, so make sure the depth of your bag can handle it. It wouldn't look great on a small bag! I wouldn't recommend using directional fabric, but if you absolutely must then I've worked out which bit needs to be where for you! One piece 13" W x 17.5" H & One piece 9" W x 12" H . You will also need one 7" zip, one 11" zip and some double sided basting tape such as Collins Wonder Tape. 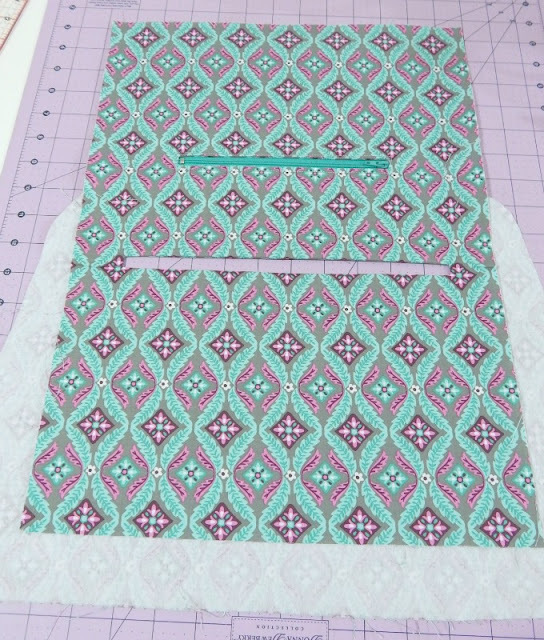 Apply the fusible interfacing to both pocket pieces. 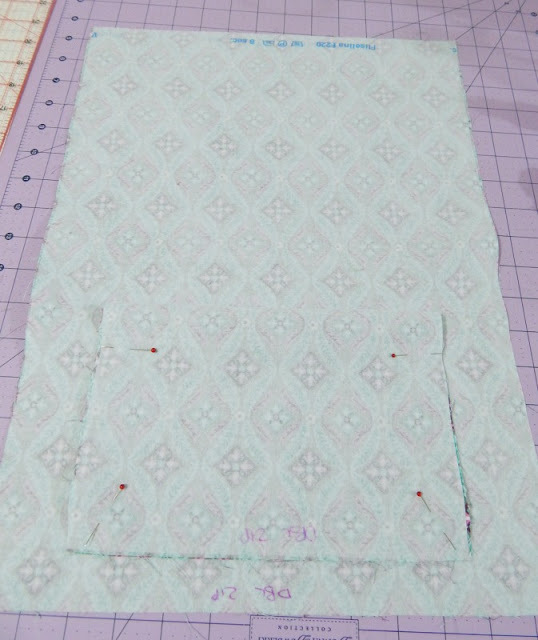 Lay the smaller pocket piece right side down on top of the larger pocket piece, 1" from the bottom. If you are using directional fabric, the large pocket piece should be right way up, the smaller pocket piece should have the print upside down. 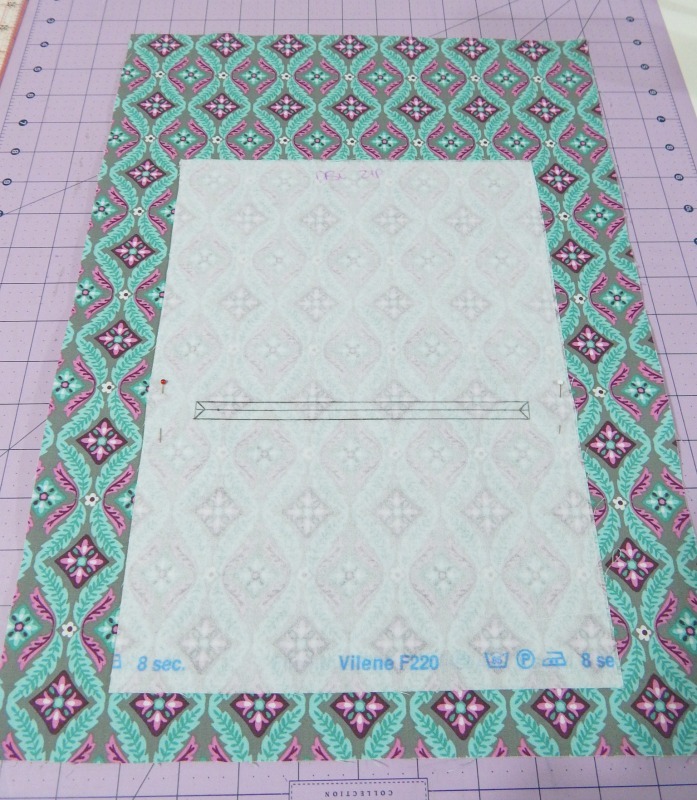 Draw a box 3/8" high and 7" wide, placing it 5" from the bottom of the small pocket piece. Add a central line and a small triangle at either end. Sew around the box, then steam the stitches. Remove the pins and cut through the line and each triangle at the ends, making sure not to cut into the stitches. Push the small pocket piece through the large piece and press well. Press from the right side first to ensure that any little creases are hidden. Lay double sided basting tape along the very edge of both long sides of the box on the wrong side and add the zip face down with the teeth showing through the box. 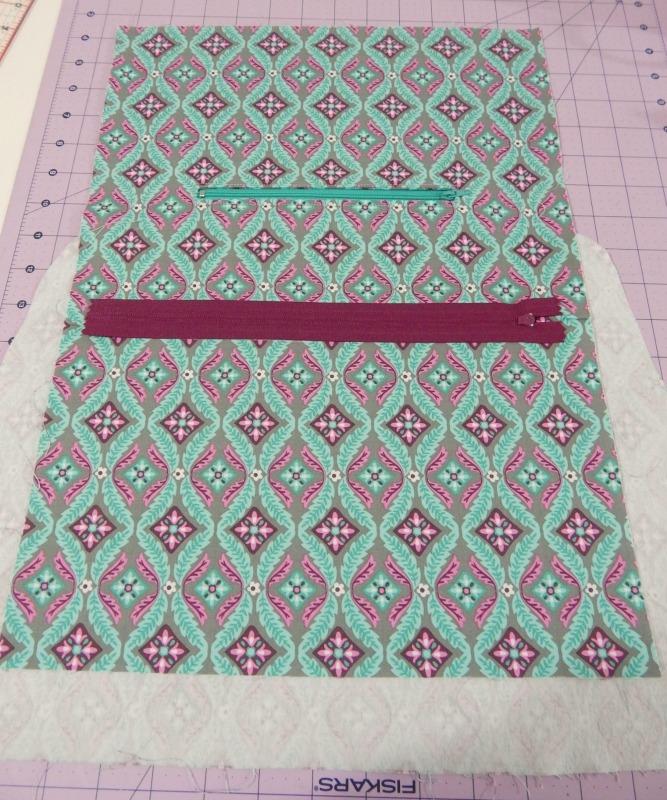 Stitch around all four sides of the box using a 1/8" seam allowance to hold the zip in place. Stop with the needle down, lift the presser foot and wiggle the zip pull out of the way if you need to before continuing around the rest of the box. On the wrong side of the pocket pieces, fold the small pocket piece down so that the raw edges meet, and pin. Sew around the three edges of the small pocket piece without catching the large pocket piece. Try to ignore the small pocket from now on! 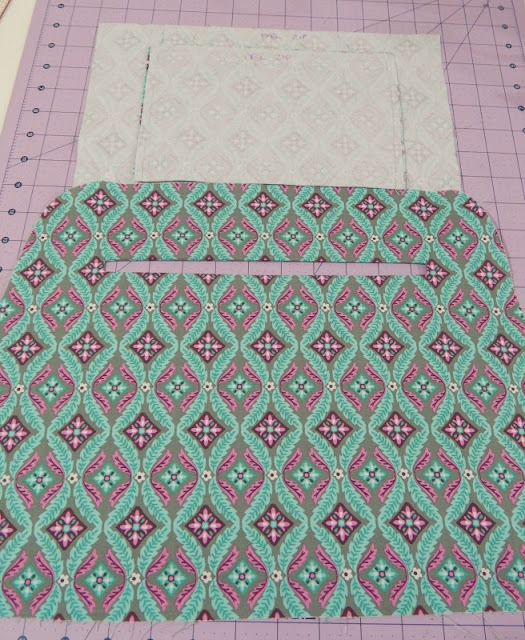 Lay the large pocket piece on top of your lining panel. In this case I'm using the Nappy bag pattern, so my measurements are for that. 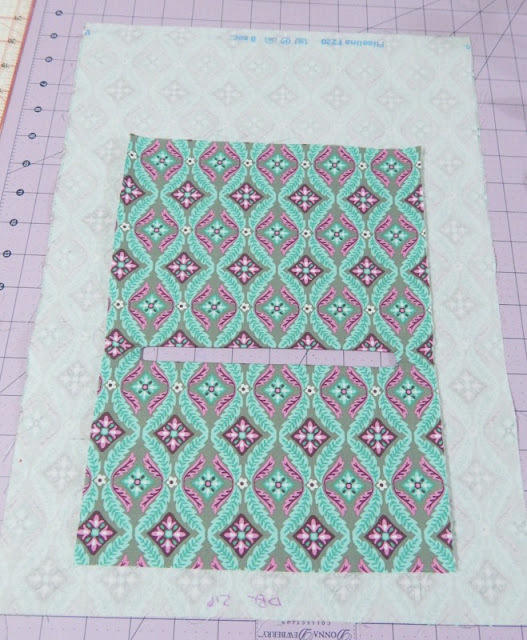 Place the large pocket piece with any directional print upside down. 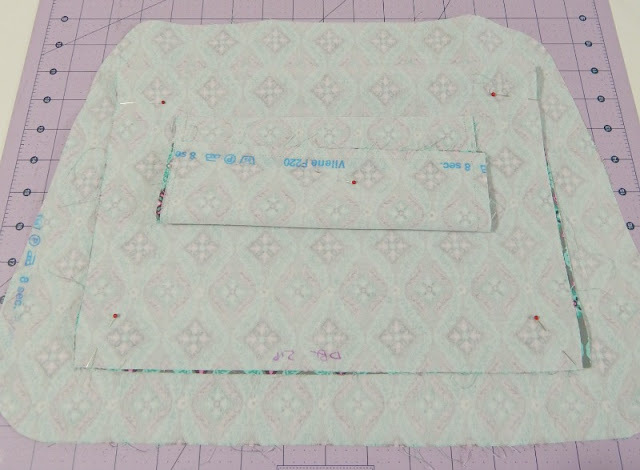 You should place this pocket piece 1.5" from the bottom of the Nappy bag lining panel. Draw a zip box 3/8" tall and 11" wide. Place it 7.5" from the bottom of the large pocket piece. 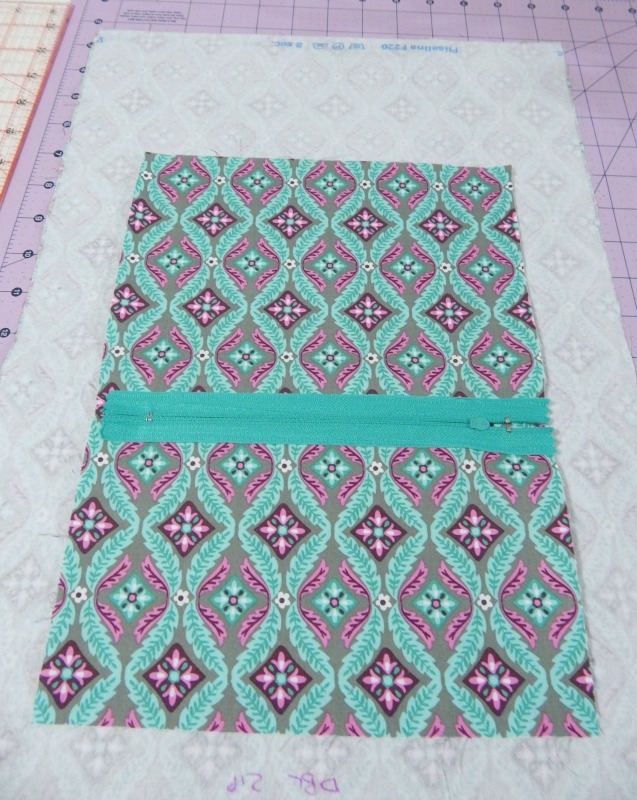 You'll notice my box is only 10" wide because I am using a 10" long zip from my stash. 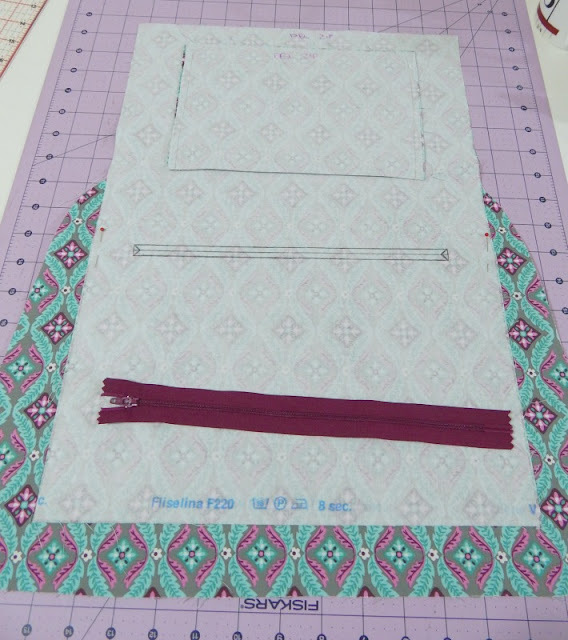 As before, sew around the box, steam the stitches, cut through the central line and triangles and then push through to the back of the main lining panel. This will feel a bit odd and bulky because of the smaller zipped pocket, but persevere! 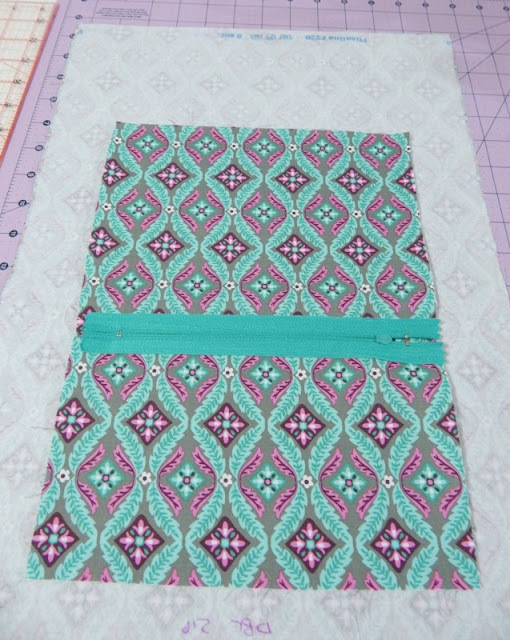 Add double sided basting tape to the back of the box and add the zip as before. Sew around all four sides of the zip box on the right side as you did for the small zip pocket. On the wrong side of the lining panel, fold the large zip pocket down matching raw edges and stitch around all three sides ensuring you don't catch the main lining panel, or the small zip pocket in the stitching. I like to pin the small zip pocket out of the way for this step. 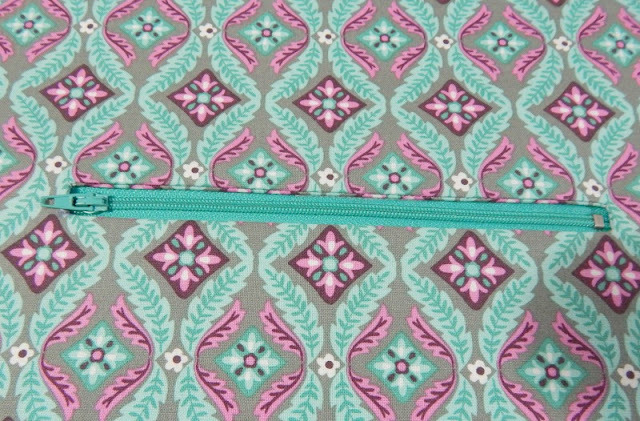 Once you've finished, you can just treat this lining panel as you would any other, and from the outside it looks like a regular zipped pocket. 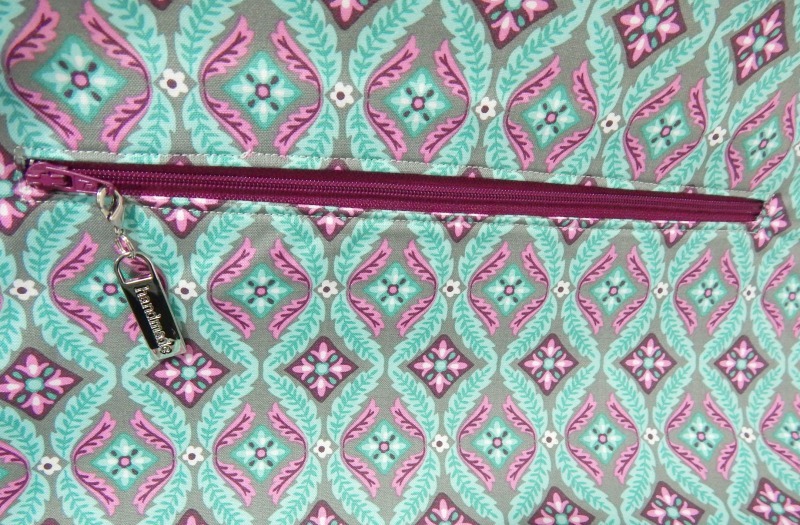 I added a 'Handmade' zip pull from Emmaline Bags for a bit of extra bling, and to make it quick and easy to pull the zip open when asked for a brochure (or business card, or small toffee). It's only when the pocket is open that you'll see the second zip pocket making it safe and discreet. 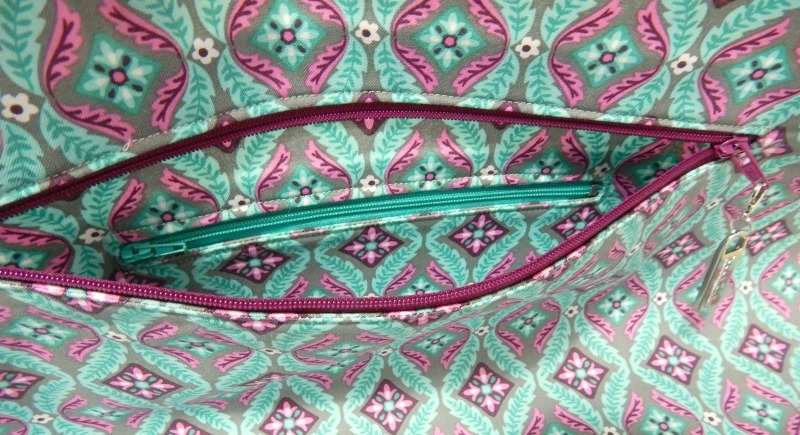 I can't wait to show you the finished bag for Amanda, but there's still more features to add! Have you modified the Nappy bag to suit your needs? If so I'd love to hear from you!